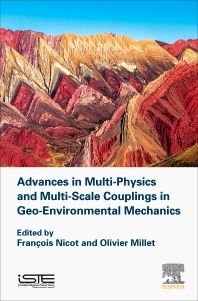 Advances in Multi-Physics and Multi-Scale Couplings in Geo-Environmental Mechanics reunites some of the most recent work from the French research group MeGe GDR (National Research Group on Multiscale and Multiphysics Couplings in Geo-Environmental Mechanics) on the theme of multi-scale and multi-physics modeling of geomaterials, with a special focus on micromechanical aspects. Its offers readers a glimpse into the current state of scientific knowledge in the field, together with the most up-to-date tools and methods of analysis available. Each chapter represents a study with a different viewpoint, alternating between phenomenological/micro-mechanically enriched and purely micromechanical approaches. Throughout the book, contributing authors will highlight advances in geomaterials modeling, while also pointing out practical implications for engineers. Topics discussed include multi-scale modeling of cohesive-less geomaterials, including multi-physical processes, but also the effects of particle breakage, large deformations on the response of the material at the specimen scale and concrete materials, together with clays as cohesive geomaterials. The book concludes by looking at some engineering problems involving larger scales. François Nicot is a graduate from « Centrale de Lyon »school. He joined Cemagref (now IRSTEA) in 2000, where he currently works as Research Director. He has been Editor-in-Chief of the international journal "European Journal of Environmental and Civil Engineering" since 2009, and co-directs the GDRI (international research group) GeoMech since 2008. Author of more than 150 international publications, his research focuses on the geomechanics and behavior of granular materials. Olivier Millet is Professor in Mechanics and Civil Engineering at La Rochelle University in France. Until recently, he was the head of MeGe GDR.